The typical flow around a sail is showed in a schematic picture in the figure 1. Due to the complexity of the flow structure and for sails with high aspect ratios (the ratio between sail height and width) in the past the difficult aerodynamic tri-dimensional problem had to be split into two two-dimensional problems: the first one on a section plane perpendicular to the mast, and the second problem on the so-called Treftz plane, perpendicular to the apparent wind. 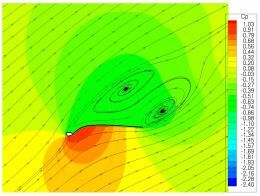 Figure 1 - Flow field around a sail: on the section plane (perpendicular to the mast) the vorticity and the lift force are generated; on the Treftz plane, a downstream plane perpendicular to the apparent wind direction, the tip vortices and the induced drag are created. Figure 2 - Qualitative scheme showing the aerodynamic forces for a close-hauled point of sail: the heeling force is strong ad the design aim is to minimize the aerodynamic drag while avoiding stall occurrences. 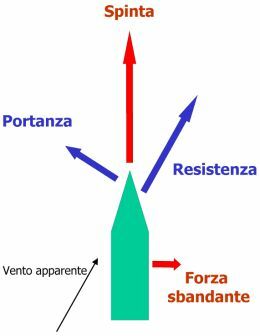 Figure 3 - Qualitative scheme showing the aerodynamic forces for a running to broad reach point of sail: the drag together with the lift provide the thrust and a good design minimize the heeling force. Figure 4 - Flow field around the mainsail of a Tornado class catamaran in close hauled point of sail: it can be seen the mast section and the sail (thick black line). The apparent wind direction can be deducted from the streamlines. The figure depicts a plane perpendicular to the mast at about 7m height, therefore above the headsail head. The sail behaves like a wing at high angle of attack in stall conditions. The streamlines do not manage to follow the sail contours and go around a large region of separated flow. In these conditions, the lift force diminishes and the drag force increases. The color map represents the adimensionalised pressure field. Figure 5 - Flow field around the sails of a Tornado class catamaran in close hauled point of sail: it can be seen the mast section, the headsail and the mainsail (both in thick black lines). The apparent wind direction can be deducted from the streamlines. The figure depicts a plane perpendicular to the mast at about 3m height. The headsail is stalled, however it helps directing the flow on the mainsail avoiding boundary layer separation and contributing to the generation of lift. The color map represents the adimensionalised pressure field. Figure 6 - Lift coefficient for the Tornado class catamaran in close hauled point of sail. Increasing the angle of attack results in increasing the portion of the sail surface interested by stall conditions. The thrust force diminishes correspondingly (n.b. the sail position has been kept constant changing the wind direction). Viscous and inviscid results are compared in the picture (viscoso and non viscoso respectively). Figure 7 - Drag coefficient for the Tornado class catamaran in close hauled point of sail. Increasing the angle of attack results in increasing the portion of the sail surface interested by stall conditions. The thrust force diminishes correspondingly (n.b. the sail position has been kept constant changing the wind direction). Viscous and inviscid results are compared in the picture (viscoso and non viscoso respectively). Figure 8 - Flow field around the sails of a Volvo Ocean 60 for a running to broad reach point of sail, computed by the inviscid simulation. The apparent wind direction can be deducted from the streamlines. The mainsail is stalled. The streamlines on the upper side of the gennaker increase their distance from the surface indicating that the flow is slowing down and, most likely, a boundary layer separation and stall will occur. Figure 9 - Flow field around the sails of a Volvo Ocean 60 for a running to broad reach point of sail, computed by the viscous simulation. The apparent wind direction can be deducted from the streamlines. The mainsail is stalled. The two boundary layer separations, on the mainsail and on the rear part of the gennaker, are much better defined due to the full evaluation of the viscous stresses at the sail surface, though the global picture is qualitatively similar to the inviscid one shown in the Figure 8. Figure 10 - Color map of the absolute value of the wind velocity around the sails of a Volvo Ocean 60 for a running to broad reach point of sail, computed by the inviscid (above) and viscous simulation (below). The two results are qualitatively similar. The flow acceleration of the front part of the gennaker surface is similar for the two pictures. The blue portions of the flow fields indicate low velocity regions where stall conditions are likely to occur. Figure 11 - Thrust coefficient for the Volvo Ocean 60 60 for a running to broad reach point of sail for a wind direction of 90 to 140 degrees. 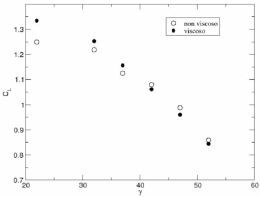 The agreement of the inviscid (non viscoso in the figure), viscous (viscoso) and experimental results (misure sperimentali) is excellent. Maximum thrust is obtained for an apparent wind angle of 120 degrees. Figure 12 - Lateral force coefficient for the Volvo Ocean 60 60 for a running to broad reach point of sail for a wind direction of 90 to 140 degrees. 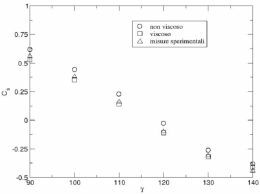 The agreement of the inviscid (non viscoso in the figure), viscous (viscoso) and experimental results (misure sperimentali) is excellent. Minimum side force coefficient (approximately zero) is obtained for an apparent wind angle of 120 degrees. This procedure allowed to obtain an approximate solution to the complete problem before the computer age. Today, the computer solution of a complex engineering aerodynamic problem represents a routinely practice in the aeronautical, naval and automotive industries. A Computational Fluid Dynamics (CFD) computer code solves the equations governing the fluid flows on a discrete mesh. The equations governing the mechanics of fluids (a coupled non linear system of five partial differential equations) have been known since the 18th century, though they had to wait until the computer age, started in the 60s and 70s, for their practical use as an engineering analysis and a design tool. A computer simulation yields, in fact, the determination of all aerodynamic conditions (density, pressure and velocity of the air flow, as well as all derived quantities such as vorticity for instance) in an arbitrary number of discrete points in a tri- dimensional domain, which includes, in our case, the sails. This is somewhat similar to what can be obtained with wind tunnel experiments, and this is why the computer simulations are sometime called virtual experiments. Accuracy and reliability of the results, originated either by measurements or by CFD simulation, need to be based on specific expertise and know-how and have to be determined quatitatively by engineers and fluid dynamicists. 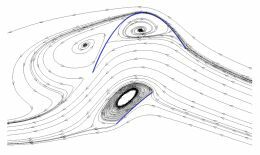 Vorticity and lift, and so propulsion and thrust, are generated on the section plane by the interaction between the sail section and the flow. The Figures 2 and 3 show schematic pictures of the force diagrams on a section plane for upwind and downwind sails respectively. 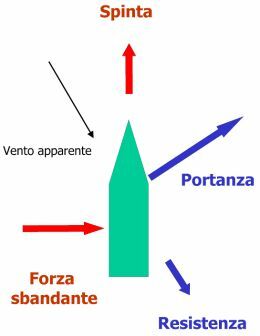 The interaction between the flowing wind and the two sails generates an overall force acting on the sails which can be split into a drag force, in the direction of the incoming apparent wind, and into a lift force, perpendicular to it. However, because in the general case the wind blows in a direction which is not the direction of the sailboat motion, it is more convenient to split the overall force into a thrust force in the direction of the boat motion and into a side force, perpendicular to the direction of motion. Back to the Figure 1, two trailing vortices which develop downstream of the sail, are due to the air stream moving from the pressure side to the suction side at the two sail ends, and are exactly similar to those developing on the airplanes wings. The trailing vortices determine a new resistance term, called induced drag, which adds up to the viscous drag originating by the viscous interaction between the surface and the boundary layer. Beside the viscous and induced resistances, another type of resistance can play an important role in sail aerodynamics, much more than in wing aerodynamics: the profile drag, also called pressure drag. Pressure drag arises when the angle of attack of the flow gets high and the boundary layer detaches from the sail surface determining a large region of ricirculating flow on the suction side. The surface is then said to be stalled. The separation will increase the size of the wake, and the pressure losses in the wake due to eddy formation. Bluff bodies, as opposed to streamlined bodies, interact with the air flow generating large regions of vortices and ricirculating flows and are characterized by a large pressure drag. These cases are of no interest in aeronautics because stall conditions have to be avoided. Downwind sail aerodynamics however counts on large pressure drag together with large lift for generating thrust, as shown in the Figure 3. Pressure drag can be important also in upwind sail aerodynamics, though in these cases it behaves as an aerodynamic brake, as seen in the Figure 2. A good aerodynamic design of upwind sails must, therefore, minimize the overall aerodynamic resistance. The fact that, in sails aerodynamics, the dominant component of the aerodynamic resistance is the pressure drag, may have an important consequence in computer modelling and simulation. Though all kind of resistances are in fact generated by the action of viscosity, in the case of pressure resistance, its quantitative determination would depend only upon the shape of the sail and would be independent of viscosity. Whenever situations with large regions of separated flow occur, viscous stresses become negligible in the vortices region, due to the low speed of the air flow, and the accurate representation of the pressure field around the sail represents the condition for the accurate determination of the pressure drag. More precisely, what really matters is the capability to correctly capture the extent of the wake region. If the truncation errors of the numerical computation (small, however always present) are sufficient to correctly determine the separation points of the flow around bluff bodies, then this objective can be probably achieved disregarding the computation of the viscous stresses which in turn would allow the use of coarser meshes of higher quality and easier to be generated. Downwind sails can be certainly regarded as bluff bodies and upwind sails may behave in the same way in stall conditions. 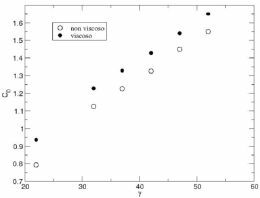 In the following, upwind and downwind sails will be discussed in more details, comparing results obtained using the full turbulent viscous approximation and the inviscid approximation where the viscosity is disregarded. The test case is concerned with a catamaran of the Olympic Class Tornado sailing at a speed of 12 knots, with a real wind speed of about 12 knots (at 45 degrees with respect to the direction of motion). The resulting apparent wind speed is about 22 knots, at some 22-23 degrees. The Figure 4 shows the flow structure around the main sail on a section plane at a height of about 7 meters, higher than the headsail tip: the mast is represented by the white ellipse, and the main sail by the thick black line. The apparent wind direction is shown by the streamlines. The sail profile behaves as a zero-thickness airfoil at a large angle of attack in stall conditions: the streamlines do not manage to follow the profile contour and go around the large separated flow region, the lift force diminishes and the pressure drag increases. The Figure 5 shows the flow structure on a section plane at a height of about 3 meters. The headsail is stalled, however it helps directing the flow on the mainsail avoiding boundary layer separation and contributing to the generation of lift. In order to quantify the overall performance, evaluation of the global aerodynamic forces is needed. These are generally expressed in the form of non- dimensional lift and drag coefficients, denoted by the terms Cl and Cd, and represented in the Figures 6 and 7. 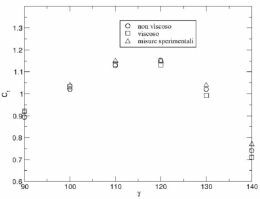 Lift coefficients for viscous and inviscid simulations are very close to each other; the two evaluations of the drag coefficient show a difference of the order 10%. The use of other viscous turbulent models provided very similar results. Most of the mainsail surface does not show flow separation, which is confined in the upper part of the sail surface. Lift and pressure drag can be correctly evaluated by both simulations, while the viscous drag is missed by the inviscid simulation, though numerical errors (called truncation errors in numerical analysis) may play the role of a fake additional drag. Without experimental evidence, it is however difficult to say which model is the best one for such upwind sail simulation, and the variability of the computed results can be considered as the engineering uncertainty. The test case for downwind sails is concerned with the Volvo Ocean 60 rig made of the mainsail and the gennaker, with an apparent wind direction of about 140 degrees. 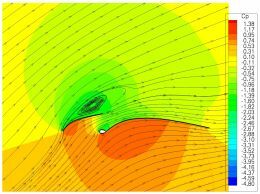 The Figure 8 shows the flow structure around the sails produced by the inviscid simulation: the direction of the apparent wind is shown by the streamlines (disregarding a few degrees due to upwash). The mainsail is stalled. The streamlines on the upper side of the gennaker increase their distance from the surface indicating that the flow is slowing down and, most likely, a boundary layer separation and stall will occur. The Figure 9 shows the same picture obtained with the viscous simulation. The two boundary layer separations, on the mainsail and on the rear part of the gennaker, are much better defined due to the full evaluation of the viscous stresses at the sail surface, though the global picture is qualitatively similar to the inviscid one. The Figure 10 shows the colour map of the absolute value of the fluid velocity for the inviscid (upper map) and the viscous computations (lower map). The results are very much similar: the flow acceleration on the front part of the gennaker (and the corresponding pressure decrease) is approximately the same on both pictures. The blue portions of the maps indicate very slow velocity and possibly stall conditions. The Figures 10 and 11 show the thrust and the lateral force coefficients respectively, for an apparent wind direction of 90 to 140 degrees. Experimental measurements, obtained for a scaled model (1:12.5) at the wind tunnel of the University of Auckland in New Zealand, are available in the literature and are reported in the two figures together with the results of the viscous and inviscid computations. The agreement among the three sets of results is excellent. Maximum thrust is obtained for an apparent wind angle of about 120 degrees, corresponding to minimum (close to zero) lateral force coefficient. In that case, lift and drag equally contribute to the generation of thrust. With respect to the case of upwind sails, the simulations of downwind sails are easier because the accurate evaluation of the viscous stresses close to the surface can probably be disregarded, and the large resistance force is accurately determined by the pressure field only. 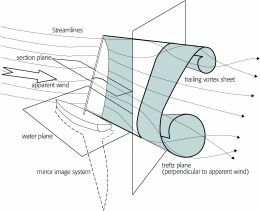 The application of CFD codes to the flow analysis around downwind and upwind sails gave excellent results both qualitatively and quantitatively, particularly for the downwind sail case where experimental measurements were available. This prediction capability candidates the CFD to become, in the years to come, a precious tool which can help the designer beside or even instead of the experimental measurements. 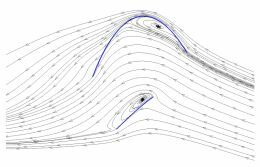 The analysis of the flow field around the sails, both in the downwind and upwind points of sail, led the authors to formulate the hypothesis that the viscous contributions are negligible to the correct determination of the overall resistance. The hypothesis has been validated and the good results, obtained with a relatively low computational effort, indicate that the CFD is a promising tool in sails design and testing.